Received as a Christmas gift! Received as a Christmas gift! Best dates I have ever tried!!! So good, I ordered 5 more boxes of their 2lbs. Organic dates . Amazing! Must have! Just had my first date with your dates! Yummy and healthy! Also, I dig the packaging and like the recipes and ideas you post on Instagram. 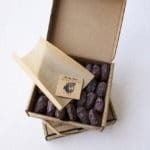 Ordered the organic medjool dates, have just ordered more. They are wonderful!!!! Soft, chewy, not too sweet, just right!!! Will definitely be back again and again. Your dates are the best! I have just ordered my 4th or 5th Box this year…after having suffered through an inferior box that my husband talked me into substituting them with -he said they were the same, only cheaper! They were whatever Costco was selling. They weren’t horrible or anything, but the difference is like night and day- it took me a while to use them up, so now I’m back, and I intend to only buy your dates in the future. 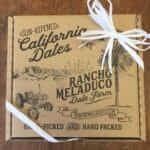 Rancho Meladuco Dates are superior to any others. The quality and freshness is incomparable to what you buy at farmers markets and Whole Foods. 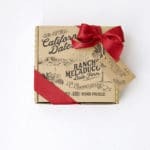 I had heard lovely things about this small farm but when the box arrived, the personalized touch of the packaging , a handwritten note and recipe card made the purchase all the more special. I shared them with my coworkers, some of which were not a fan of dates. Once they popped these soft, Caramel tasting gems in their mouth, there was silence and awe on how amazing these dates were. Thank you Joan for the lovely care and attention to detail. I am obsessed and gifting friends and family . I have been buying my dates from Whole Foods for the past year. 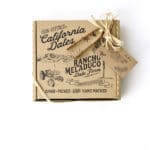 I didn’t know what I was missing until I ordered from Rancho Meladuco. These dates are the softest, freshest, most flavorful dates I’ve ever had. I was also very happy to have the option of purchasing ‘organic’ dates. 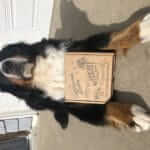 I already ordered 3 boxes and will be ordering more very soon. They’re delicious at room temp or frozen. I also love them with some peanut butter and cacao nibs. You won’t be disappointed with these delicious dates. They taste good poolside in Miami! Got these as a gift in Miami – Had them with mediteranian food, these dates are better than ice cream! For your friend who buys all of their produce at their local farmer’s market, these plump and juicy medjool dates are hand-picked and hand-packed in the Coachella Valley. These dates were not like the tough, chewy, dry variety that I was accustomed to buying at the local grocery store. They were a whole different beast, succulent and juicy…a candy-like delicacy that impressed even those who thought that maybe they didn’t like dates. They were scrumptious. Medjool dates are the ultimate healthy sweet snack treat and Rancho Meladuco Dates are the ultimate in medjool date luxury.